All of these things contribute to the overall performance of the network. But if your WiFi is not working properly it is often a symptom of interference that can be fixed with some minor tweaks. 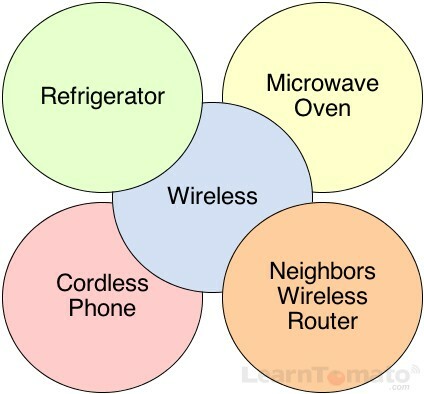 Wireless routers have radio transmitters built-in. In a Wireless LAN (WLAN) environment, a signal is broadcast from a radio transmitter. That signal is received by a client device. Corresponding TCP/IP packets are sent back to the transmitter where they are routed either inside or outside of the network. In order to receive the broadcast and communicate with the transmitter, the client device must have a Network Interface Controller (NIC) capable of speaking the same language. When I say, “the same language” I’m referring to the same signal frequency and the same wireless spectrum. What is a Wireless Spectrum? Most wireless products use the following Wi-Fi spectrums: 802.11a, 802.11b, 802.11g, 802.11n, 802.11ac. These Wi-Fi spectra are established by The Institute of Electrical and Electronics Engineers, a non-profit organization also known as the IEEE. This is why you’ll often see “IEEE 801.11a/b/g/n” on retail boxes for wireless devices, routers, etc. Contrary to the marketing hype, Wi-Fi spectrum is not based on speed alone. The frequency band is equally important. In fact, each frequency band has its own advantages and disadvantages. What is a WiFi frequency band? There are basically two frequency bands used for Wi-Fi technology, 2.4GHz and 5GHz. 2.4GHz has been around longer. It’s also an unregulated frequency. As a result, vendors can manufacture 2.4GHz devices less expensively than regulated spectrum like the 5GHz band. The downside to this “unregulated” band is that manufacturers use it for everything: cordless phones, baby monitors, microwaves, garage door openers, etc. 5GHz is a regulated frequency which costs manufacturers more to produce. The 2.4GHz band offers better range. It handles obstacles better than 5.0GHz. However, 5GHz offers much faster throughput for maximum performance. It just doesn’t handle obstructions and channel noise quite as well. However, keep in mind that because there are more 2.4GHz wireless networks, the frequency channels can become crowded in some areas. Interference and obstructions greatly affect the range and quality of a wireless signal. Interference often comes from noise created by other wireless routers, cordless phones, baby monitors, etc. Obstructions are physical obstacles like walls and trees or large metal objects such as a refrigerator. Remember this when troubleshooting because it may not be just one thing causing problems. It could be that there are too many devices using the same frequency. It could also be multiple obstacles, inadequate antenna gain, or a little of everything. What is WiFi channel frequency? The 2.4GHz and 5GHz frequencies each have their own set of channels. 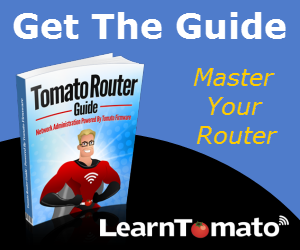 You can usually choose “auto” or manually set channels within your router. Crowded channels produce low quality signals that lead to instability and intermittent connectivity problems. You can often increase signal quality by changing the channel. So, what is the “best” channel? In the following image, I’m using a software called inSSIDer (developed by MetaGeek.net) to survey the wireless broadcasts in the area. As you can see, the 2.4GHz frequency offers 11 channels to choose from, most of which are already in use by several neighbors nearby. A closer look reveals that some wireless SSID’s are using two “channels” and those that do, have higher “max rates” than the other networks. This dual channel scenario is known as “channel bonding.” Channel bonding bonds two channels together by increasing the channel width. 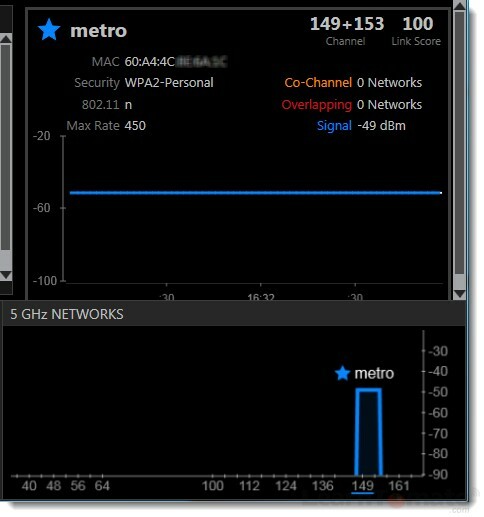 What is WiFi channel width? By increasing the channel width, we can increase the speed and throughput of a wireless broadcast. By default, the 2.4 GHz frequency uses a 20 MHz channel width. A 20MHz channel width is wide enough to span one channel. A 40 MHz channel width bonds two 20 MHz channels together, forming a 40 MHz channel width; therefore, it allows for greater speed and faster transfer rates. Obviously, two channels are better than one, right? In theory, yes. But not if those channels are crowded with noise and interference. In crowded areas with a lot of frequency noise and interference, a single 20MHz channel will be more stable. 40MHz channel width allows for greater speed and faster transfer rates but it doesn’t perform as well in crowded areas. However, noise and interference is not always the issue. Sometimes it’s the distance. If greater distance is the primary objective, my preference is the 2.4GHz band. If you discover that all of your neighbors are using the 2.4GHz band and your wireless performance is unreliable, first try changing the channel. 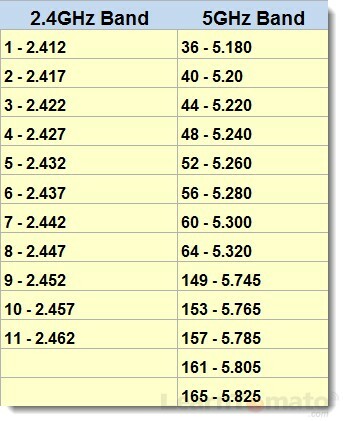 Channels 1,6,11 are preferable for the 2.4Ghz band. 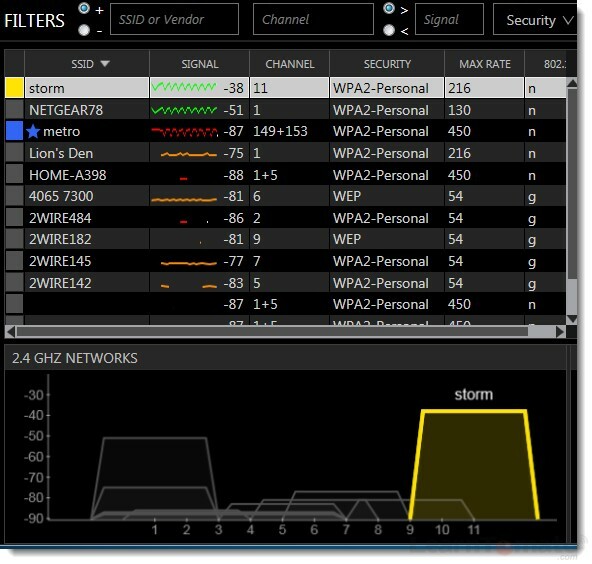 If after changing the channel, your connection is still unreliable, you may find it beneficial to “get away from the crowd” and use the 5GHz band. In the following image (still using the inSSIDer software from MetaGeek.net) you’ll see that on the 5GHz band I’m all alone. There are no other wireless SSID’s in the area. Therefore, even if 5GHz isn’t as strong at penetrating obstacles, the link quality is excellent because I’m the only one broadcasting on this frequency. This is like traveling on an open highway that no one else is using. For my particular situation, the 5GHz band provides a more reliable connection. Not to mention that I had 25 neighbors trying to share a handful of preferred channels on the 2.4GHz band. Granted, the range is not quite as far with 5GHz but it is acceptable throughout the entire building. 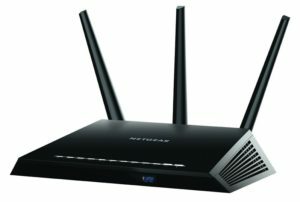 Before you rush out and buy a new router, consider this: (1) It may not be necessary, and (2) If it is necessary, make sure you’ve got everything you need. First and foremost, it may not be necessary. If my area was not so crowded, I would have preferred to stick with my 802.11n, 2.4GHz, 40MHz channel width for a nice blend of both impressive speed, and maximum distance. Unfortunately, with so many access points nearby, changing the channel on my 2.4GHz band only helped temporarily. It worked like a charm until someone’s router hopped onto the same channel. When that happened, their broadcast created enough noise to disrupt communication between the router and the wireless card on my laptop. Bye-bye Internet connection. In addition to that, I would be better off choosing the 20Mhz channel width to decrease the amount of interference incurred by other devices. 40Mhz is best used with 5Ghz bands or uncrowded 2.4GHz bands. In crowded areas, it can be a “battle of air space” to stabilize your network. In addition to changing channels, sometimes you can achieve more wireless stability by increasing the transmit power of your wireless broadcast. By increasing the transmit power, you are essentially increasing the voltage to the broadcast transmitter and ultimately “squelch” the neighboring broadcast with your own broadcast. Not all routers have this ability from the factory. In fact, this is one reason people often install custom firmware (like Tomato and DD-WRT) onto their router. Secondly, if the upgrade is necessary, make sure you’ve got the right stuff. 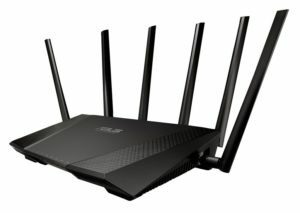 In order to send and receive data packets on the 5GHz band, you’ll need two things: (1) a router capable of broadcasting 5GHz signal, and (2) a 5GHz wireless network card installed on your client computer. These days, most smart phones and tablets have dual band Wi-Fi so they can connect wirelessly to either band. However, older laptops may only have 2.4GHz Wireless cards. So, even if you’re broadcasting a 5GHz signal, your laptop won’t be able to connect. The remedy? Buy a 5GHz Wireless USB adapter or replace the laptop’s single band wireless card with a dual band wireless card (one capable of handling both frequencies).